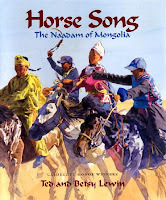 Fantastic art brings Naadam and the people of Mongolia to life in Horse Song. The story is told in a memoir-esque voice and illustrated with a combination of photograph-like paintings and cartoon-y illustrations. The paintings are stunning, giving the reader an inside glimpse of their trip as Ted and Betsy Lewin take readers along for the ride. The cartoon illustrations lighten the mood with a little humor. About two-thirds of the population of Mongolia are nomads. There are twice as many horses as people in Mongolia. And every year there are sports festivals called Naadam. Naadam gives the isolated nomads of Mongolia a chance to congregate and celebrate their heritage with friendly competition. Ted and Betsy Lewin traveled to Mongolia to witness Naadam and, in particular, a horse race. During Naadam, child jockeys speed across the desert on half-wild horses, each hoping to win the shiny gold medal for finishing first. Naadam dates back almost 1000 years and is the second-longest-running sports competition in the world (second to the Olympics). You'll know Ted Lewin from his Caldecott-honor-winning illustrations of Peppe the Lamplighter. You'll know Betsy Lewin from her Caldecott-honor-winning illustrations of Click Clack Moo: Cows That Type. But if you're like me, you had no idea that Ted and Betsy Lewin have collaborated on a number of books about their travels. I sincerely look forward to perusing Gorilla Walk, Elephant Quest, and Top to Bottom Down Under. Do check out Ted's website and Betsy's website. And, as always, check out Picture Book of the Day for your Non-Fiction Monday roundup.